Is the stone in your home granite? Over the last decade granite rock has become so common in homes and that anyone these days can name it when they see it. What most people call granite, geologists are likely to call “granitoid” until they can get it into the lab. Here’s a simplified explanation. Granitoid meets two criteria: (1) it is a plutonic rock that (2) has between 20 percent and 60 percent quartz. * Plutonic rocks cooled at depth very slowly from a hot, fluid state. A sure sign is well-developed, visible grains of various minerals mixed in a random pattern. They look clean, and they don’t have strong layers or strings of minerals like those in sedimentary and metamorphic rocks. * As for quartz, a rock with only a little quartz is something else, and a rock with more than 60 percent quartz is officially called quartz-rich granitoid (a remarkably simple answer). Geologists assess both of these criteria with inspection. OK, we have abundant quartz. Next comes the feldspar, which is always present in plutonic rocks whenever there’s quartz. That’s because quartz (pure silica) only forms when there’s too much silicon oxide to be packed into feldspar. Feldspar is the next-highest mineral in silica content, but it also includes aluminum, calcium, sodium and potassium. When enough of these other elements run out, quartz starts to form. There are two types of feldspar: alkali feldspar and plagioclase. Granites also have dark minerals, sometimes quite a lot and sometimes hardly any. Usually feldspar-plus-quartz dominates, and geologists call granitoids felsic rocks in recognition of this. A true granite can be rather dark, but if you ignore the dark minerals and assess only the felsic component, it can still be properly classified. Light-colored granites can be nearly pure feldspar-plus-quartz—that is, they may be very highly felsic. That qualifies them for the prefix “leuco,” meaning light-colored. Leucogranites may also be given the special name aplite, and leuco alkali feldspar granite is called alaskite. 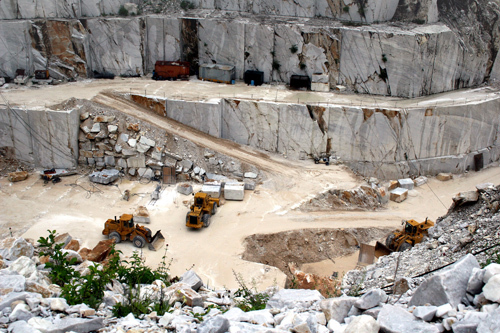 Leuco granodiorite and leuco tonalite are called plagiogranite (making them honorary granites). Dark minerals in granitoids are rich in magnesium and iron.These are called the mafic (“MAY-fic”) component. An especially mafic granitoid may have the prefix “mela,” meaning dark-colored. The most common dark minerals in granitoids are hornblende and biotite. Still more mafic a mineral is olivine. Normally olivine and quartz never appear together, but in exceptionally sodium-rich granite the iron-bearing variety of olivine, fayalite, is compatible. The granite of Pikes Peak in Colorado is an example of such a granite. A granite can never be too light, but it can be too dark. What stone dealers call “black granite” is not a granite at all, because it has little or no quartz in it. It’s not even a granitoid (although it is a true commercial granite). It’s usually gabbro, but that’s a subject for another day.